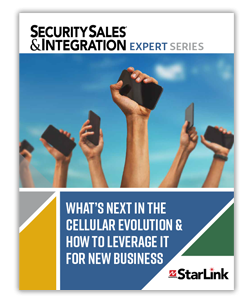 There’s undeniably a lot of upside for savvy installing security contractors and fire/life-safety professionals whose billable offerings keep pace with the ongoing evolution of cellular technology, i.e., the demise of older cellular networks and the introduction of faster, more robust LTE communications. The meteoric rise of cell phone technology and consumer adoption in the last 40 or so years, has been quite a wild ride. No longer are phones’ principle use for making calls, and in place of the original 25-pound brick devices few lugged around in the early ’80s, today virtually everyone, old and young, has one handily in their pocket or wearable on their wrist. Likewise, the connections they allow, SMS text, talk and social media, or interacting with all parts of the home or business, on-the-go, has proven one of the greatest, most addictive phenomena of our times. The digital convenience factor and the scary place in which we live have combined, such that security too has a new starring role in consumer’s wants and needs on those very phones, whether it’s virtual security system control, remote video monitoring or long-distance doorbells.